The coconut cake is one of Grandma’s recipes, where cups or glasses were still used as the best way to measure out the ingredients. The flavour of the coconut together with that of hazelnut cream, more commonly known as Nutella, is unmistakable, as is the soft consistency of this lovely cake. Take care to add the Nutella when the cake is still pretty warm, or you won’t be able to spread it out easily. Then, before digging in, you must let it cool completely. Finally you will be able to enjoy this scrumptious cake, and its aroma will envelop your house, enticing your friends and family. Anyone who really loves coconut and is fond of Nutella won’t be able to resist making this cake, maybe for a very special occasion. Are you ready to learn how to make this coconut and Nutella cake? Place the eggs and sugar in food mixer and beat together well, then sift in the two flours with the baking powder. Add the milk and oil and continue to mix for about 10 minutes, until the ingredients are completely blended. Pour the mixture thus obtained into a greased springform cake tin, diameter 22 cm. Bake at 180 °C for about 40 minutes. 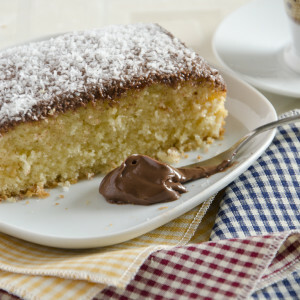 Spread the Nutella® on the surface of the coconut cake while still warm and sprinkle with coconut flour. If you want to make this cake for your children’s birthday party or another special occasion, don’t miss the opportunity to give it a touch more originality with a topping of icing sugar shaped into hearts. Nutella as we know it now was not the same in 1946 when it was invented: it was called ‘Giandujot’ and was marketed as a loaf made with sweet hazelnut dough, cocoa and sugar. This could be cut and then spread on bread; later, in 1951, Giandujot changed into the cream paste that we all know and love.